MINNEAPOLIS – The Virginia basketball team is full of competitive guys. You don’t get to the National Championship Game without players cut from that cloth. That comes in many forms. Some subtle. Some internal. Not with Ty Jerome, though. No, his competitiveness is exactly what you’d expect for a player whose game was raised on the courts of New York City. It’s confident. It’s out in the open. It’s downright brazen at times. Call it the gall to ball. UVA fans saw that early when he went to work for a bucket against reigning National Champion Villanova on the road. And again as sophomore at Duke in front of a shell-shocked Cameron Indoor Stadium. So when the Cavaliers stepped on to their sport’s biggest spotlight Saturday night in a Final Four showdown with Auburn, no one should have been surprised with Jerome’s lack of stage fright. The junior guard delivered a game-high 21 points, matched his career high with 9 rebounds, and handed out 6 assists for good measure. That competitive streak shows up far away from the bright lights all the time too. Whether that dates back to shooting contests with his dad and brother in a gym or to the players’ lounge at the John Paul Jones Arena for video game battles, Jerome wants to see your best shot. And he wants to win. And he might – OK, not might, he will – let you hear about it. Friend and team manager Grant Kersey called it a good competitive and said you see it in “anything” with Jerome from halfcourt shots for fun to Madden. It definitely shows up on the court, both in practice and in games. UVA senior Jack Salt said you could see it early in Jerome’s career too, even with the Hoos’ strength and conditioning coach Mike Curtis. Sometimes, Jerome lets that edge marinate and motivate too. While all of Virginia’s players took the loss to UMBC hard last year, the aftermath seemed to anger Jerome in a different way. He likes to prove people’s perceptions wrong and he likes to prove he and his team belong among the nation’s best. When he came across a Yahoo! Sports article from Pat Forde last year, Jerome took note of how it called the UVA program a ‘towering fraud’ because of a loss in March. Nevermind, that the Hoos had won 31 games and swept the ACC Regular Season and ACC Tournament crowns. While Jerome didn’t remember the exact title – Historic Loss Shows Virginia Was Built To Fail In March – he did remember the premise. He didn’t miss the chance to get a dig in on that during a media breakout session in Minneapolis and said he wanted Forde to hear it. That type of edge is what fuels Jerome’s competitive fire. It’s what drew Virginia coach Tony Bennett toward Jerome when he first started recruiting him. That’s not surprising either. Bennett is as fierce a competitor as you’ll find too, whether that’s in the basketball arena, at the ping pong table, or anywhere else. 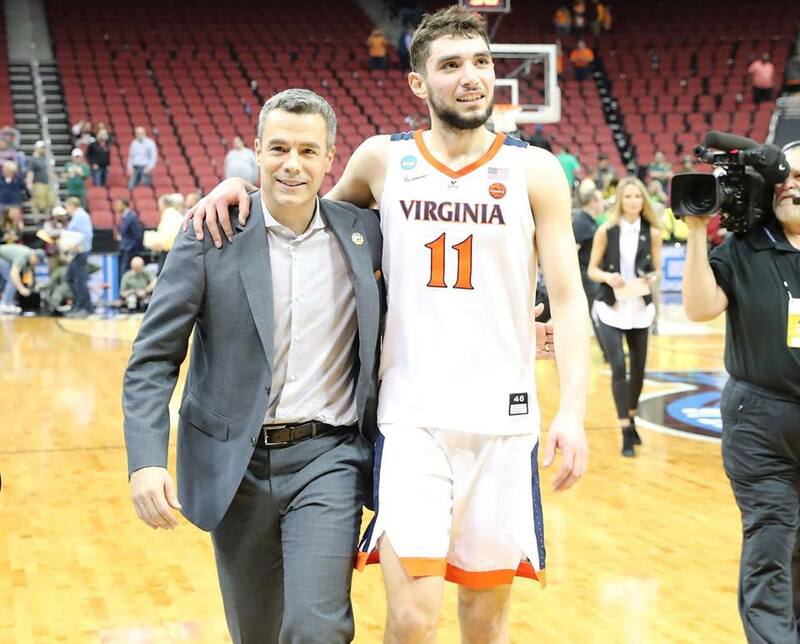 So when a younger, smaller, skinnier Ty Jerome helped his team advance in a Pennsylvania tournament where Bennett was watching another player, the Cavaliers’ coach took a mental note and mentioned it to his staff. But just as quickly as he landed on the UVA radar, he fell off again. At least until Bennett ended up at his court again that same summer while watching another player. He wasn’t slipping Bennett’s mind this time. This time, he became a recruiting priority. That competitive something that Jerome clearly has now, he had then and Bennett wanted him in orange and blue. That eye test from Bennett trumped the conventional eye test of recruiting. As Jerome himself put it, the normal eye test says: “Not athletic. Not long. Don’t look strong. All those things.” He’s used to it at this point. It’s not like that’s a new line of thinking. At 6’5” and 195 pounds with plenty of guile and a high-level understanding of how to play basketball, none of that seems to matter. Jerome has averaged 13.5 points, 4.2 rebounds, and 5.2 assists for Virginia this season. He’s up to 194 assists on the season, putting him in a tie for sixth on UVA’s single-season list. He was named third-team All-ACC last season and earned a second-team nod this season. Jerome’s done it with a mix of long-range marksmanship that’s daringly deep at times and floaters off the glass. Those are a little more conventional. But he’s done it away from the norm with twisting, leaning, funky-angled shots too. While they may be unusual, however, they’re not haphazard. Jerome works on those tougher shots because he knows he’ll need them and he takes similar shots in practices too. He hit one of those against the Tigers when he jumped sideways and leaned out to get the shot off. Jerome’s fourth foul came after he couldn’t score in the post against the physical defense of Jared Harper. He thought he was fouled and in a moment of frustration tried to poke the ball away in the backcourt. The late moments can’t overshadow just how big Jerome was against Auburn, though. Jerome made the pass to Kyle Guy in the corner that led to the game-winning free throws, but even in answering a question about how he felt after the game, Guy flipped gears mid sentence to praise Jerome. “He played freakin’ phenomenal. 21, 9, and 6 – he carried us through this game,” Guy said. 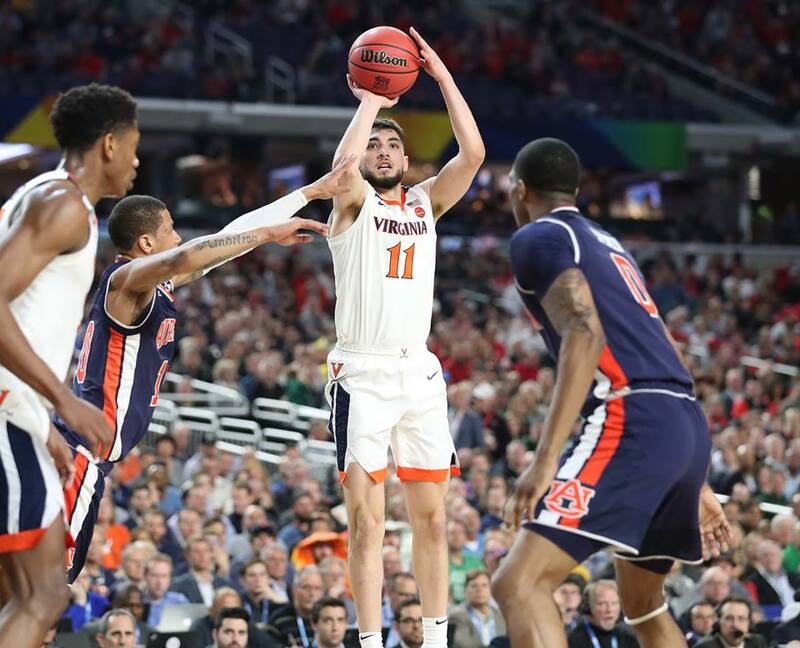 A 21-9-6 line in the national semifinals is definitely something Virginia fans should remember for a long time. Jerome scored 13 of his 21 points in the first half to keep the Hoos in it as that accounted for nearly half of their 28 points. He made two key 3-pointers in the second half run that built a 10-point lead, which allowed the Cavaliers to survive the Tigers’ late surge. Most importantly, however, Jerome continued to set the tone that UVA can play in March and April in the NCAA Tournament and that the Hoos won’t back down from the other side. That’s the exact competitive drive that’s elevated Virginia from national afterthought to the National Championship Game in Bennett’s 10 years.